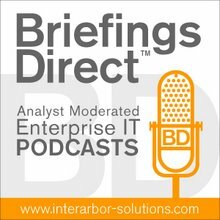 The next BriefingsDirect deep-dive big data benefits case study interview explores how Moscow-based Otkritie Bank, one of the largest private financial services groups in Russia, has built out a business intelligence (BI) capability for wholly new business activity monitoring (BAM) benefits. The use of HP Vertica as a big data core to the BAM infrastructure provides Otkritie Bank improved nationwide analytics and a competitive advantage through better decision-making based on commonly accepted best information that's updated in near real-time. To learn more about Otkritie Bank's drive for improved instant analytics, BriefingsDirect sat down with Alexei Blagirev, Chief Data Officer at Otkritie Bank, at the recent HP Big Data 2014 Conference in Boston. The discussion is moderated by me, Dana Gardner, Principal Analyst at Interarbor Solutions. Gardner: Tell us about your choice for BI platforms. Blagirev: Otkritie Bank is a member of the Open Financial Corporation (now Otkritie Financial Corporation Bank), which is one of the largest private financial services groups in Russia. The reason we selected HP Vertica was that we tried to establish a data warehouse that could provide operational data storage and could also be an analytical OLAP solution. It was a very hard decision. We tried to refer to the past experience from our team, from my side, etc. Everyone had some negative experience with different solutions like Oracle, because there was a big constraint. We cannot integrate operational data storage and OLAP solutions. Why? Because there should be high transactional data put in the data warehouse (DWH), which in every case, was usually the biggest constraint to build high-transactional data storage. Vertica was a very good solution that removed this constraint. While selecting Vertica, we were also evaluating different solutions like IBM. We identified advantages of Vertica against IBM from two different perspectives. One was performance. The second was that Vertica is cost-efficient. Since we were comparing Netezza (now part of IBM), we were comparing not only software, but also software plus hardware. You can’t build a cluster of Netezza custom-size. You can only build it with 32 terabytes, and so on. We were also limited by the logistics of these buildings blocks, the so-called big green box of Netezza. In terms of Vertica, it's really efficient, because we can use any hardware. So we calculated our total cost of ownership (TCO) on a horizon of five years, and it was lower than if we built the data warehouse with different solutions. This was the reason we selected Vertica. Get the free HP Vertica Community Edition. Become a member of myVertica. From the technical perspective and from the cost-efficient perspective, there was a big difference in the business case. Our bank is not a classical bank in the Russian market, because in our bank the technology team leads the innovation, and the technology team is actually the influence-maker inside the business. So, the business was with us when we proposed the new data warehouse. We proposed to build the new solution to collect all data from the whole of Russia and to organize via a so-called continuous load. This means that within the day, we can show all the data, what’s going on with the business operations, from all line of business inside all of Russia. It sounds great. When we were selecting HP Vertica, we selected not only Vertica, but the technical bundle. We also hosted the Replicator. We chose Oracle GoldenGate. We selected the appropriate ETL tool, and the BI front end. So all together, it was a technical bundle, where Vertica was the middleware technical solution. So far, we have build a near-real-time DWH, but we don’t call it near-real-time; we call it "just-in-time, because we want to be congruent with the decision-making process. We want to influence the business to let them think more about their decisions and about their business processes. Everything appears really quick and it's actually influencing business to make decisions, to think more, and to think fast. As of now, I can show all data collected and put inside the DWH within 15 minutes and show the first general process in the bank, the process of the loan application. I can show the number of created applications, plus online scoring and show how many customers we have at that moment in each region, the amounts, the average check, the approval rate, and the booking rate. I can show it to the management the same day, which is absolutely amazing. The tricky part is what the business will do with this data. It's tricky, because the business was not ready for this. The business was actually expecting that they could run a script, go to the kitchen, make a coffee, and then come back. But, boom, everything appears really quickly, and it's actually influencing the business to make decisions, to think more, and to think fast. This, I believe, is the biggest challenge, to grow business analytics inside the business for those who will be able to use this data. As of now, we are setting the pilot stage, the pilot phase of what we call business activity monitoring (BAM). This is actually a funny story, because this is the same term referenced in Russia to Baikal-Amur Mainline (BAM), a huge railroad across the whole country that connects all the cities. It's kind of our story, too; we connect all departments and show the data in near real-time. In this case, we're actually working on the next phase of BAM, and we're trying to synchronize the methodology across all products, across all departments, which is very hard. For example, approval rates could be calculated differently for the credit cards or for the cash loans because of the process. Since we're trying to establish a BI function almost from ground zero, HP Vertica is only the technical side. We need to think more about the educational side, and we need to think about the framework side. The general framework that we're trying to follow, since we're trying to build a BI function, is a United Business Glossary (or accepted services directory), first of all. It's obvious to use Business Glossary and to use a single term to refer to the same entity everywhere. But it is not happening as of now, because the business unit is still trying to use different definitions. I think it's a common problem everywhere in the business. The second is to explain that there are two different types of BI tools. One is BI for the data mart, a so-called regular report. Another tool is a data discovery tool. It's the tool for the data lab (i.e. mining tool). So we differentiate data lab from data mart. Why? Because we're trying to build a service-oriented model, which in the end produces analytical services, based on the functional map. When you're trying to answer the question using some analytics, actually it is a regular question, this is tricky. All the questions that are raised by the business, by any business analyst, are regular questions; they are fundamental. The correct way to develop an analytical service is to collect all these questions into kind of a question library. You can call it a functional map and such, but these questions, define the analytical service for those functions. For example, if you're trying to produce cost control, what kind of business questions do you want to answer? What kind of business analytics or metrics do you want to bring to the end-users? Is this really mapped to the question raised, or you are trying to present different analytics? As of now, we feel it's difficult to present this approach. And this is the first part. The second part is a data lab for ad hoc data discovery. When, for example, you're trying to produce a marketing campaign for the customers, trying to produce customer segments, trying to analyze some great scoring methodology, or trying to validate scientific expectations, you need to produce some research. It's not a regular activity. It's more ad hoc analysis, and it will use different tools for BI. You can’t combine all the tools and call it a universal BI tool, because it doesn't work this way. You need to have a different tool for this. This will create a constraint for the business users, because they need some education. In the end, they need to know many different BI tools. This is a key constraint that we have now, because end-users are more satisfied to work with Excel, which is great. I think it's the most popular BI data discovery tool in the world, but it has its own constraints. I love Microsoft. Everyone loves Microsoft, but there are different beautiful tools like TIBCO Spotfire, for example, which combines MATLAB, R, and so on. You can input models of SAS and so on. You can also write the scripts inside it. This is a brilliant data discovery tool. But try to teach this tool to your business analyst. In the beginning, it's hard, because it's like a J curve. They will work through the valley of despair, criticizing it. "Oh my God, what are you trying to create, because this is a mess from my perspective?" And I agree with them in the beginning, but they need to go through this valley of despair, because in the end, there will be really good stuff. This is because of the cultural influence. Gardner: Tell me, Alexei, what sort of benefits have you been able to demonstrate to your banking officials, since you've been able to get this near real-time, or just-in-time analytics -- other than the fact that you're giving them reports? Are there other paybacks in terms of business metrics of success? Blagirev: First of all, we differentiate our stakeholders. We have top management stakeholders, which is the board. There are the middle-level stakeholders, which are our regional directors. I'll start from the bottom, and the regional directors. They just open the dashboard. They don’t click anything or refresh. They just see that they have data and analytics, what’s going on in their region. They don’t care about the methodology, because there is BAM, and they just use figures for decision making. You don’t think about how it got there, but you think about what to do with these figures. You focus more on your decision, which is good. They start to think more on their decision and they start to think more on the processing side. We may show, for example, that at 12 o’clock our stream of cash loan applications went down. Why? I have no idea. Maybe they all went out for dinner. I don’t know. But nobody says that. They say, "Alexei, something is happening." They see true figures and they know they are true figures. They have instruments to exercise operational excellence. This is the first benefit. The second, is top management. We had a management board where everyone came and showed different figures. We'd spend 30 minutes, or maybe hour, just debating which figures were true. I think this is a common situation in Russian banks, and maybe not only banks. Now, we can just open the report, and I say, "This is a single report, because it shows intra-day figures and shows this metrics, it was calculated according to methodology." We actually linked the time of calculation, which shows that this KPI, for example, was calculated at 12 o’clock. You can take figures at 12 o’clock, and if you don’t believe them, you can ask the auditors to repeat calculation, and it will be the same way. Nobody cares about how to calculate the figures. So they started to think about what methodology to apply to the business process. Actually, this is reverse of the focus from the outside, focusing on what’s going on with our business process. This is the second benefit. Gardner: Any other advice that you would give to organizations who are beginning a process toward BI? Try to disclose all your company and software vision, because Vertica or other BI tools are only a part. Try to see all the company's lines, all information. Blagirev: First of all, don’t be afraid to make mistakes. It's a big thing, and we all forget that, but don’t be afraid. Second, try to create your own vision of strategy for at least one year. Third, try to disclose all your company and software vision, because HP Vertica or other BI tools are only a part. Try to see all the company's lines, all information, because this is important. You need to understand where the value is, where is the shareholder value is lost, or are you creating the value for the shareholder. If the answer is, yes, don’t be afraid to protect your decision and your strategy, because otherwise in the end, there will be problems. Believe me. As Gandhi mentioned, in the beginning everyone laughs, then they begin hating you, and in the end, you win. Gardner: With your business activity monitoring, you've been able to change business processes, influence the operations, and maybe even the culture of the organization, focusing on the now and then the next set of processes. Doesn’t this give you a competitive advantage over organizations that don’t do this? Blagirev: For sure. Actually, this gives a competitive advantage, but this competitive advantage depends on the decision that you're making. This actually depends on everyone in the organization. Understanding this brings a new value to the business, but this depends on the final decision from people who sit in the position. Now, those people understand. They're actually handling the business and they see how they're handling the business. I can compare the solution to other banks. I have been working for Société Générale and for the Alfa-Bank, which is the largest bank in Russia. I've been the auditor of financial services in PwC. I saw the different reporting and different processes, and I can say that this solution is actually unique in the market. Why? It shows congruent information in near real-time, inside the day, for all the data, for the whole of Russia. Of course, it brings benefit, but you need to understand how to use it. If you don’t understand how to use this benefit, it's going to be just a technical thing.